Kamiah, Idaho (August 8, 2016) – Fire activity slowed on the Cedar fire, burning in the Selway-Bitterroot Wilderness, due to cooler temperatures and light precipitation over the weekend. 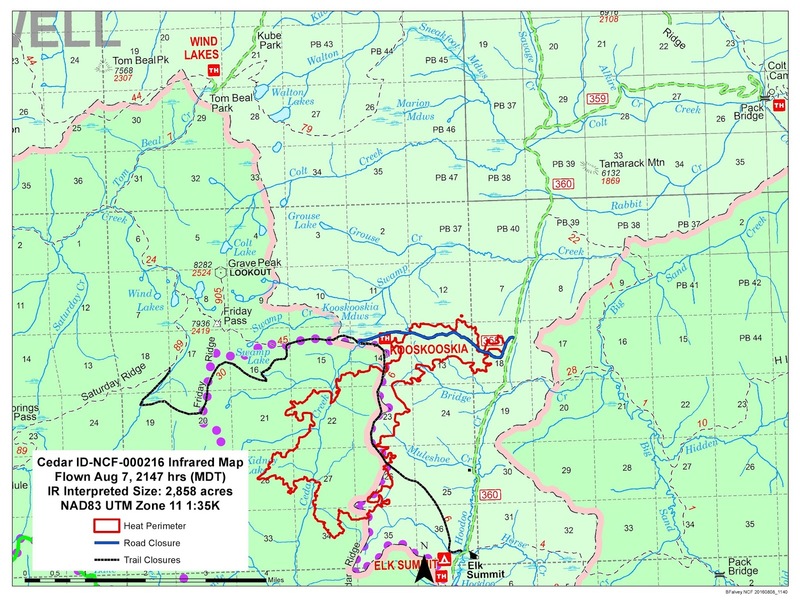 The July 17, lightning caused fire, is under the management of the Powell Ranger Station and is located 2 miles northwest of Elk Summit and 11 miles south of the Powell Ranger Station. Growth on the Cedar fire, estimated to be 2,858 acres, over the weekend was to the north and east. The fire has progressed approximately ¼ miles north of FS Road #358. Some growth also occurred to the south on northwest slopes in the Cedar Creek drainage. No intense heat was detected in an early morning Infra-Red detection flight, but scattered heat remains throughout the fire’s perimeter. The fire is burning in mature Spruce and Sub-alpine fir in the Cedar Creek drainage, Lodgepole Pine stands on the ridge tops, and Cedar in wet areas. Closures: Public health and safety due to wildfire has prompted the closure of Forest Service road #358, KoosKooskia road. Forest Service trail #30 is closed entirely and trail #45 is closed from the trailhead at the junction of road #358 to the junction of trail #30. Forest Service trail #6, Cedar Ridge, remains closed. The fire is currently not threatening life or property, but precautionary point protection measures in the form of sprinklers have been added to the Bridge Creek, Hoodoo Creek and Swamp Creek bridges. Long term management of the fire is planned to meet resource objectives and maintain the natural occurrence of fire in wilderness. The fire will continue to be closely monitored by ground and aerial resources to protect potential values at risk. During active burn periods, smoke is visible from the Elk Summit road, the Powell Ranger Station and in the Bitterroot Valley. Fire managers are working with air quality specialists to monitor smoke and potential impacts to communities. 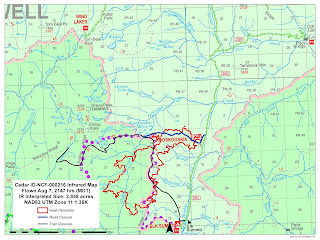 Fire and closure information will be posted on InciWeb at http://inciweb.nwcg.gov/incident/4874/, the Lolo Pass Visitor Center, Savage Pass, Elk Summit, the junction of the Forest Service road 358 and Forest Service road 360 and on the Nez Perce-Clearwater National Forests website. For more information, please call (208) 942-3113.